If you’re looking for a slender and exotic tropical fan palm to grace your garden or landscape, Licuala grandis will be well worth considering! An excellent small-sized palm tree that is perfect, both for container planting or grown on the ground, and ideal too for indoors or outdoors. Let this graceful and magnificent Vanuatu Fan Palm that is very popular among tropical palm collectors charm you! 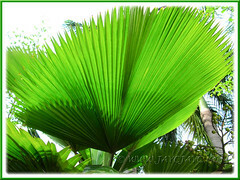 Its solitary and slim trunk that is brightly topped with a green canopy of large and attractively pleated fan-shaped leaves, is beauty and elegance at its best! Besides, under good growing conditions, it will flower frequently and set berry-like fruits that ripened to a bright red, further enhancing its beauty with that eye-catching red radiance against its glossy green-coloured foliage. Etymology: The species epithet grandis means great, big or large in Latin, named thus to allude to its distinctly large-sized leaf blades. 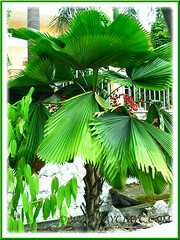 Features: Licuala grandis is an attractive and small-sized palm species of the fan palm genus, Licuala, that’s primarily grown for its exotic and unique foliage. A slow-growing solitary and single-trunked palm tree that can reach up to 10 ft (3 m) tall and has a crown spread of about 8 ft (2.4 m) wide or less. However, it’s mostly seen at lower heights, around 6 ft (1.8 m) tall. It has an upright and slender trunk, about 4-5 ins (10-12.7 cm) in diameter and is brown to grey-coloured. It will be ridged with old leaf scars and traces of fibrous leaf sheaths, sometimes providing free housing for volunteer ferns as seen in the above image. It is top-heavy with evergreen foliage, forming a beautiful canopy with its very large fan-shaped leaves, each about 22 ins (0.56 m) or more in diameter. 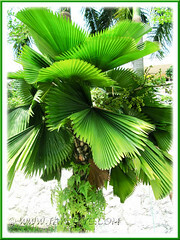 The luscious deep green costapalmate leaves are shiny and stiff, ruffled, pleated or corrugated, entire and almost circular, with notched edges. They’re held on thin and spiny petioles, 1.5-3 ft (45-91 cm) long, that emerge spirally from the central growing tip. Really captivating! 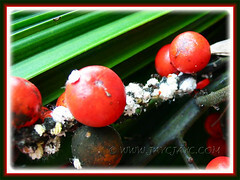 The Vanuatu Fan Palm will flower frequently under good culture. The branched and dangling inflorescence will emerge between the base of the leaves, up to 6.5 ft (2 m) long, usually longer than the fronds and bearing bisexual and inconspicuous whitish-yellow flowers. They will eventually develop into small and roundish green fruits (1-1.5 cm in diameter) that turn bright red and berry-like when ripe, each containing a single seed that can be used for propagation. Culture (Care): The compact and robust Licuala grandis or Ruffled Fan Palm grows easily with minimum care and enjoys humid and warm climes. Light: Grows best in light shade or dappled sunlight. It can tolerate full sun in the high humid tropics or once established, though the leaves may sometimes get scorched by direct sunlight. Moisture: Moderate water requirements but more water is needed during the hot and dry seasons. 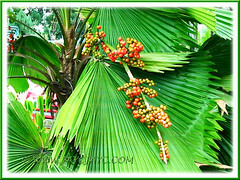 Being a rainforest understory palm, it benefits from high humid conditions. Soil: Prefers well-drained, organic-enriched and sandy loam soils. However, any soil type is acceptable, provided it’s free-draining. Others: Feed once monthly with a balanced fertilizer. Remove withered and scorched fronds to maintain its beauty and elegance. 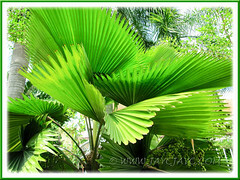 Best to provide shade from direct sunlight and protection from strong winds to avoid damage to fronds. Remove spent flowering spikes to avoid harbouring pests such as mealy bugs as seen in the right image. Generally, it’s free of serious diseases and pests. For subtropical and temperate regions: Hardiness: USDA Zone 10-11. Being an understory tropical palm, Licuala grandis is sensitive to cold weather and strong winds that may damage the foliage. Cold tolerance down to 35.5°F (2°C) with protection against frost. In non-hardy regions, it is recommended to grow it as a houseplant in a container during the colder months, providing adequate light, warmth and humidity for optimum growth indoor. Best to maintain temperatures above 50°F (10°C). Then, move it outdoor for the summer in a shaded and protected location, and bring it indoors when the temperatures get lower. Propagation: Propagate by seeds, which may take between 2 months to a year to germinate, and several more months to a year for seedlings to grow. Probably buying a seedling will be a better choice, yes? 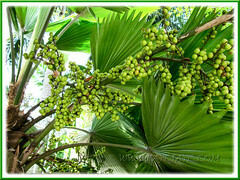 Usage: Grow Licuala grandis to add beauty and elegance to landscapes, parks and gardens. Because of its smallness and manageable size due to its slow growth habit, it’s most suitable for small yards and container planting. Good as ornamental specimen palm/tree or mass for hedges, screening and borders. 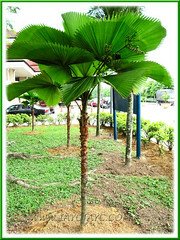 Excellent palm for avenue planting, road median planting, roundabouts and road shoulders. 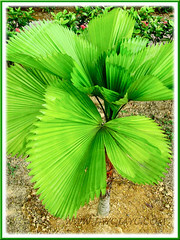 Vanuatu Fan Palm makes ideal container plant for patio, deck and poolside or indoors as a houseplant. It is also favoured by interiorscapers as indoor decor plant for shopping malls, offices, hotel lobbies and others. Szép napot , érdekl?dnék Magyarországra mennyibe kerülne, 1 Vanuatu pálma ára, szálítása? Sorry, we’re just passionate home gardeners. We are not retailers selling garden plants and products.